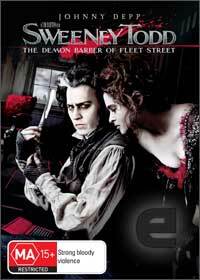 Sweeney Todd - The Demon of Barber Fleet Street is the latest incarnation of this classic British tale that is based on the musical by Stephen Sondheim and stars the talented Johnny Depp as the enigmatic Benjamin Barker who returns to 19th century London after an exile of 15 years. Framed by Judge Turpin (Alan Rickman) who unjustly imprisoned Barker and stole his wife (Laura Michelle Kelly) and daughter, Barker vows revenge and sets his plans into motion. Taking on the name of Sweeney Todd, Barker sets up a barber store above the pie shop run by the strange Mrs. Lovett (Helena Bonham Carter) who also has romantic intentions towards him. Beginning his killing spree, the newly baptized Sweeney Todd murders a rival barber (Sacha Baron Cohen) , only to cause another predicament for our anti-hero as he is unsure of where he can dispose of this body. Mrs Lovett comes up with the innovative idea to dispose of the body which ironically causes her pie store to become a popular eatery among the locals. This film directed by Tim Burton is almost a black comedy with elements of horror as the stars sing, dance and cut their way through the film which contains some brilliant acting from Carter as Mrs. Lovett and Cohen as Pirelli, not to mention Depp. All the actors are perfectly cast and match that with quite interesting songs and set designs, everything is quite inspirational and truly helps immerse you into this strange, delightful and thoroughly entertaining movie.